One of the joys of looking after a garden is seeing all the various insects and birds who decide to visit in their search for food or somewhere to live. Some of these visitors are more welcome than others, particularly some of the insects. There are insects which are pests but also many which are beneficial. I like to encourage the beneficial ones as much as possible by avoiding using chemicals to deter pests, and introducing plants to attract those that particularly help with pollination and the predatory insects which keep pests under control – more often than not this is successful. I especially like to encourage bees as they pay a vital part in pollinating my vegetable crops. Bees need all the help they can get at the moment as their numbers are dropping dramatically and can be encouraged by having plants that they particularly like to visit. They prefer single flowered forms rather than double flowered as these make it difficult for them to get to the pollen and nectar. In spring I find that bees particularly like the tiny blue flowers of rosemary and it is often my rosemary bushes that see the first flurry of bee activity of the year. 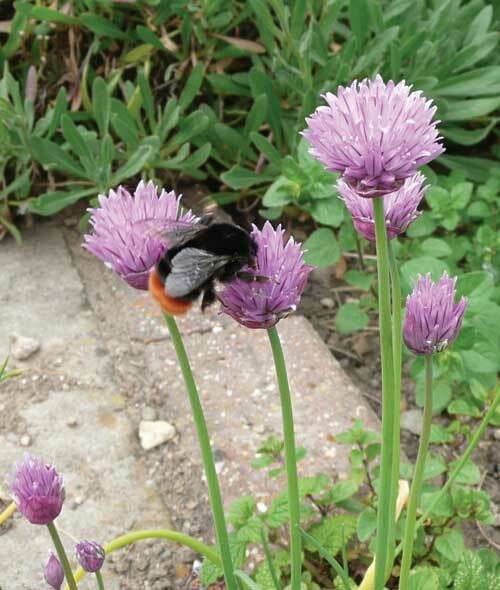 As the season progresses they then turn their attention to chives which are in flower in may. Later on and into the summer marjoram, sage, lavender and thyme are amongst their favourites. Most of these plants also have culinary uses so are particularly useful to have in the garden. As autumn approaches they are attracted to deep pink coloured ice plant and vibrant yellow rudbekias, then later still the flowers of mature ivy provide a nectar source into the winter. Butterflies are also welcome visitors as they are so attractive. The first to appear in spring are usually orange tips, they are particularly partial to purple honesty. Early on in the season there may also be visits from rather bedraggled looking commas or peacocks that have hibernated over the winter and emerge looking rather the worse for wear. Summer brings many more butterflies - whites, painted ladies, meadow browns, fresher looking commas and peacocks and occasionally speckled woods. They all are attracted by buddleia and verbena bonariensis especially as well as many other plants. Whites can be a bit of a pest as they lay their eggs on brassica crops, so I have to make sure that I keep any of these covered with netting which is a little unsightly. There are also less common visitors which always make me stop and look. From time to time a dragonfly may dart ceaselessly around on its search for food and an occasional damsel fly may visit. 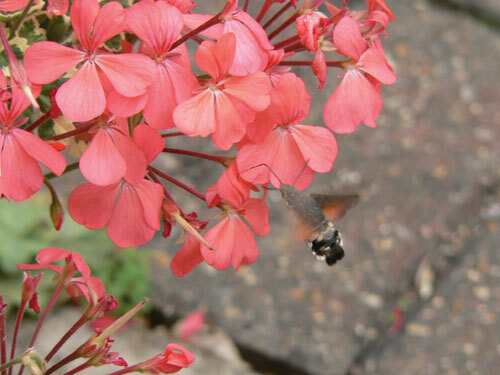 Very occasionally we are honoured by a visit from a hummingbird hawk moth which has been attracted by the summer bedding plants or tender perennials in wall pots or planters. Other insects are also very welcome as they are predators of those that are not so welcome. The larvae of ladybirds, lacewings and hoverflies live off aphids which can cause damage to so many plants and crops. I find it much more preferable to encourage these to keep the aphids under control rather than resorting to pesticides which cannot distinguish between welcome and unwelcome visitors and will kill all. I find it best to leave nature to sort things out with just gentle encouragement by having the favoured plants.